In mid-September I had the opportunity to float with 6 friends down the 62 mile stretch of the Green River known as Labyrinth Canyon in southeastern Utah. This was my first trip on the river. 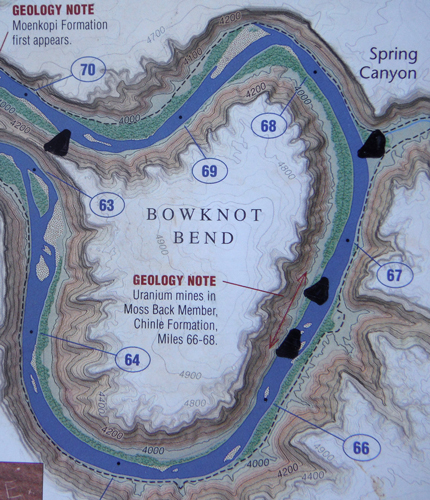 There was the spectacular scenery of the Canyon and several interesting historical sites to investigate on this adventure, but the highlight of the trip was the opportunity to explore the uranium mines associated with the Bowknot Bend. These mines, unlike others in the area, are today only accessible by boat. One of the guys in our group thought that he had spotted several pieces of equipment high above the river on one of his previous trips and was anxious to see if we could land and see what they were about. 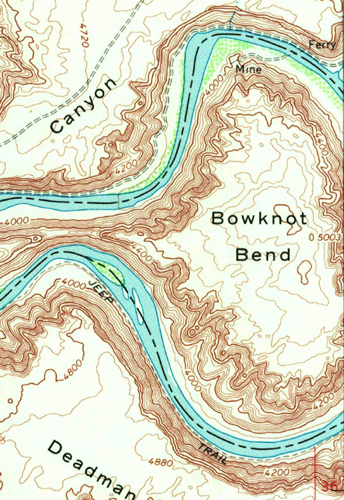 One early topo map showed that there was a ferry across the river to a mine on the bend near river mile 68. The ferry would explain how the equipment that my friend had seen would have been transported across the river. 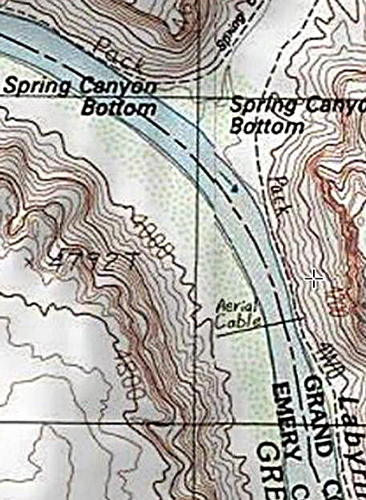 Another topo map showed an aerial cableway crossing the river. Its position was shown just south of Spring Canyon. Needless to say we were excited about the possibilities of what we might see and were anxious to get to the area. Our trip began at river mile 116, Crystal Geyser, near the town of Green River Utah. We arrived at the Bowknot four days later. As we rounded the bend near mile 68, a road on the west side of the river appeared. We associated this road with the one shown on the top topo map above. The challenge now became to find a break in the river-side vegetation. It also needed to be relatively free from mud. We had to pass up landing at other locations earlier in the trip--too much of the gooey stuff! Fortunately, we not only found a place that was free from the mud and brush, but was large enough for our group of 7 to camp. It did take some effort however to move our gear up onto the high bank above the river. After setting up the camp, it was an easy walk north to check things out. Fortunately the willows and other bushes did not extend far from the river. Near the location shown on the map with the aerial cable, we came across this set-up. A pair of thick cables extending up from the river were wrapped around this very large boulder. The cable ends were clamped together. Was this one of the anchors for the old aerial cable? Was the purpose of the two axles placed in the drill holes some sort of "backup" for the anchoring system? The two cables were at least 1" in diameter. I found a description of the aerial cable in a BLM Enivironmental Impact Statement. "Only one of the three mines, the Aileen has a record of production. Operations ocurred sometimes in the 1950's and less than 100 metric tons of uranium ore were recovered. Evidence of the operation include a cable and ore bucket that crosses the river and was also used as a means of access to the mine site." A bit further on was a second cable system. It appeared to be another anchoring station. The materials here struck me as being older than other system. There was only one cable. Its location corresponded very closely to that shown for the ferry on the top topo map. So was this part of that old system? The BLM statement did not mention this second cable system. Spring Canyon and the road associated with it were visible across the river to the east. The photos below show the area identified on the topo as the "Mine". A wooden ore chute is still standing. There did not seem to be much in the way of a camp at this location. Mindat.org references this area as the Aileen Mine. The mine tunnels of the area have been sealed and metal stamps have been left behind in their memory. A walk along the bench a mile or so south of the cable systems revealed a camp area that may have served as a living center for the workers. 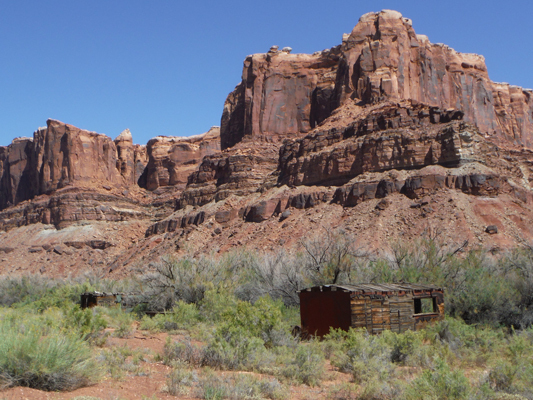 A pair of small shacks are still standing. This area is near the site of an old landing strip shown on another topo map. A badly eroded road climbed up the slope from the cabins to an old mine area. The tunnels there were also sealed. A shelf road continued south where several old vehicles and machinery were seen. 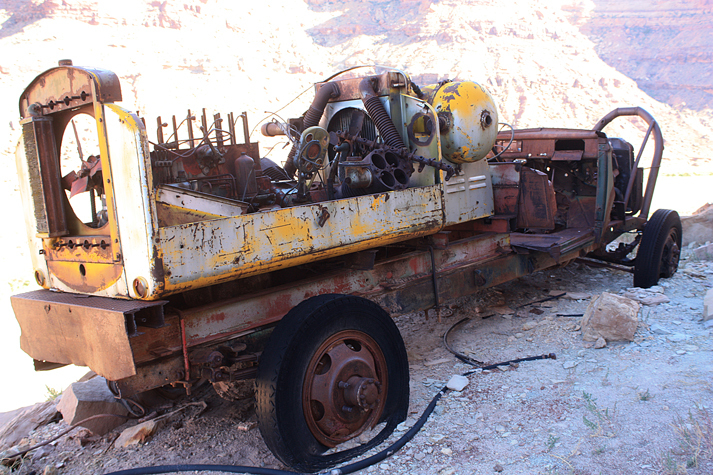 These pieces of equipment were mentioned in the BLM statement referenced above: "Also several portals and machinery are located along the old road cuts on the talus slope". The portals and machinery are physically located in an area that is assigned the name "Bowknot Mine" rather than the Aileen Mine. I do not know how the histories of the two mines are related to one another. The next photos are different views of the neat old vehicle shown in the very top photo above. It appears that its last job was to carry the large air compressor mounted on its rear frame. I have not been able to identify the truck. A bit beyond is this old military vehicle. It was 4WD and gasoline powered. Nicely parked at the end of the road was this early Terra Trac Loader. And once again, another set of sealed tunnels. This is the view from the old shelf road down onto the Green River. This is the view from river level up to the location of the old vehicles. One can be seen almost directly in the center of the photo. Access from the river at this point would be difficult. A better approach would be from a landing upstream and then a hike on the old road cuts. After the visit to this area, I could not help but be impressed by the efforts of the folks who worked to try and earn a living for themselves through the development of these mine operations!